With an estimated 100 million Americans suffering from chronic pain, relief of pain seems to be more elusive than ever. Surely, spinal injections for back pain are better than using opiate pain medications, right? Not necessarily. There were 8.9 million Americans who received injections for pain last year. Just how effective were those injections for relief of pain? This post is going to review spinal injection for back pain as an alternative to other modalities for pain relief. The choice to have one of these types of injections is complicated. 1 When Should You Have Spinal Injections? 1.1 What Types Of Injections Are Available? 1.1.1 What Are The Indications For Spinal Injection? 1.1.1.1 How Do You Go About Getting a Spinal Injection? 1.1.1.2 When Should I Avoid Getting a Spinal Injection? When Should You Have Spinal Injections? Deciding to have spinal injections is a complicated menagerie of what injection might work (there is no perfect way to know beforehand), what the patient can tolerate, what the Doctor thinks is indicated, and what your insurance will pay. Furthermore, there needs to be access to an accredited facility where the Doctors perform them. 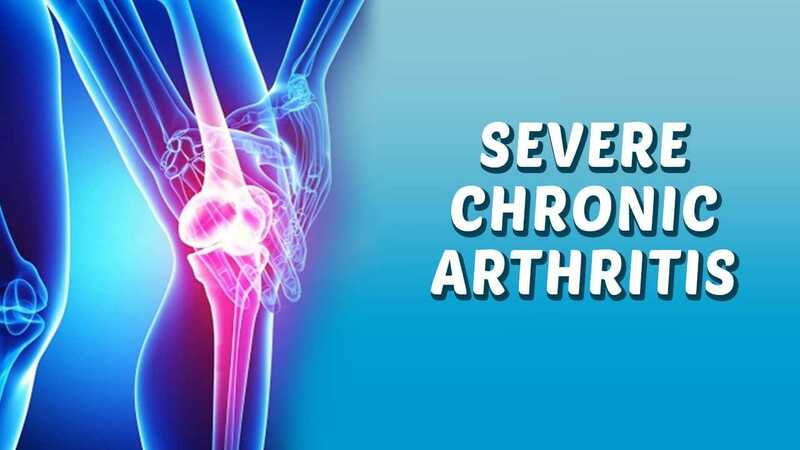 Most patients will require multiple injections and will receive temporary relief only. If the patient’s pain worsens in-between injections they will usually have to wait for their next scheduled session. Generally, insurance companies will limit the number and frequency of injections they will pay for. The administering physician will try to select the most effective injection techniques for the patient (the acceptable effectiveness for an injection is a 30% reduction in pain). The Food and Drug Administration has never endorsed steroid spinal injections. Those types of injections occupy a “gray area” in the field of pain management called, “off label usage.” Many things in medicine actually fall into this category because scientific studies for effectiveness are difficult to fund, perform, and structure. Many authorities in pain management feel very ambivalent about spinal injections for back pain when it is chronic. 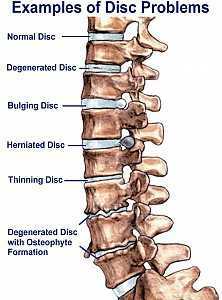 The effectiveness for acute lumbar disc herniation is much clearer. As the pain becomes more chronic the effectiveness of injection therapies becomes less obvious. So spinal injection therapy is really an attempt to find an effective alternative to having to use other expensive, chronic therapies (that being other therapies that also have a lukewarm effectiveness in treating chronic pain). As it turns out, there is no therapy available for chronic pain which is not costly and risky. 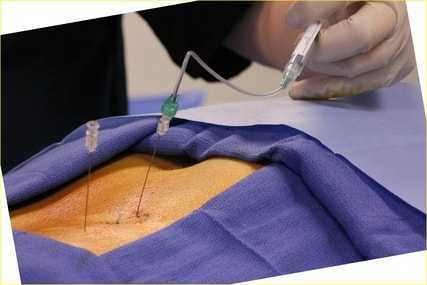 1) Epidural Injections: in this type of injection a small volume of medicine is injected into a space around the spinal cord called the epidural space. That medicine will anesthetize and decrease the swelling that is pushing against the nerves in the lower back. This is a sterile procedure and is best done with the patient lightly anesthetized (similar to the anesthesia for a colonoscopy). Sometimes, the Doctor performing the procedure will use X-Ray techniques during the procedure to ensure better needle placement. 2) Facet Injections: in this type of injection a very small volume of medicine (similar in type but a smaller amount than used in an epidural) is injected into or near a joint on the vertebrae called a facet joint. Using X-Ray guidance is the best way to do this type of injection. 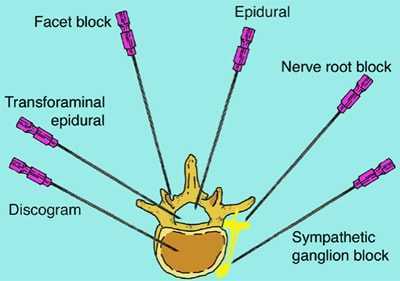 3) Caudal Injection: this is really a type of epidural injection that is given very low on the spine in an area called the sacral hiatus. It is useful for very low disc herniation (Lumbar 5 for instance) and can be done without anesthesia with just sterile draping and instruments. Though there are many other types of injections and variations, the above 3 constitute the most frequently employed techniques. 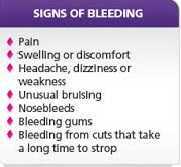 They require a minimum of surgical skill and have minimal risk of complications. What Are The Indications For Spinal Injection? This is not an exhaustive list of indications but includes most of the reasons an injection would be done. How Do You Go About Getting a Spinal Injection? The administration of a spinal injection for back pain is not usually performed by a primary care practitioner. Usually the patient will need referral to a specialist that is trained in the technique. In all cases, an MRI of the spine (with contrast) will need to be performed before a thorough recommendation can be made. I recommend that the injections be performed under anesthesia when there is no reason to not do so. Since the procedure will likely have to be repeated, making the experience as pleasant as possible for the patient is wisdom. Furthermore, optimal positioning for the procedure is easier under anesthesia (pain in an awake patient will often limit positioning). When Should I Avoid Getting a Spinal Injection? Inability to successfully resuscitate the patient in the event of an emergency (that means the right equipment and trained personnel must be present). The aforementioned conditions are not an exhaustive list but constitute the majority of reasons that a spinal injection should not be done. I have reviewed the major spinal injections for back pain, the indications, the process to setting up an injection, and the reasons to not have an injection done. These injections are considered “safe” but no injection or surgical procedure is without potential side effects and complications. Important Note This post is not a replacement for a thorough history and physical performed by a licensed medical practitioner and is not to be construed as medical advice. This posting is informational only. The usefulness of these injection techniques for chronic back pain is very limited. If after one or two injection sessions the pain recurs shortly afterwards, the likelihood for prolonged relief is very low. I hope you have enjoyed this post. Please comment.